A recent study at the Johns Hopkins Hospital concluded that a surprising number of interns lacked what is referred to as �common courtesies� when communicating with their patients. �The study leader, Leonard S. Feldman, M. D., an assistant professor of medicine at the Johns Hopkins School of Medicine, and his trained observers, followed 29 internal medicine interns for three weeks during January 2012. Feldman also reports that research suggests that not only is patient satisfaction improved with the more frequent use of bedside courtesies, but that medical outcomes improve also.1 The literature chronicles numerous references to validate that improved mental health yields better physical outcomes. To even the most skeptical, it is impossible to deny that an emotional connection with someone who is treating them, but also cares about them, decreases pain and suffering. The Johns Hopkins study clearly demonstrates that, what Feldman and his researchers label etiquette-based communication, appears to be of much less importance to many of the doctors that are entering practice today than the traditional responsibilities of physicians of past generations--- the �key difference between being a good doctor versus a good physician. The advances in the science are no excuse to abandon bedside courtesies! The answer might be found in the time-honored concept of the doctor�s role of ministering to his/her patients. Translated, this means attending to the needs of the patient. To often, we tend to forget, that those needs are not just physical. When patients refer to their doctors, but can�t recall their names or when doctors only remember their patients by their diagnoses are two examples of emotional abandonment by each party. Even more important, such physicians have failed to uphold the covenant our forefathers first made with their patients many years ago. Applying the science is only a part of the practice of medicine. In restaurant lingo, the concept is similar to eating great food, but being served by a terrible waiter. The food almost never makes up for bad service. A simple observation seems to say it all: The doctor, who is primarily concerned with the science, looks forward to the end of the shift, while the true physician looks forward to helping the next patient. Maybe, the most important legacy our generation of physicians can leave for the generations that follow are passing on the tenets that define this noble profession. 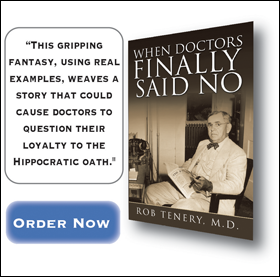 But, how can these �new� doctors know these time-honored principles, if we don�t follow them ourselves? (2) Tenery, R., Morse, L., Bedside Manners: A Compendium of Physician Relationships, Createspace, 2014.